Best Free Apps iPhone 6/6 Plus Owners Should Download Now! Just get your coveted new iPhone 6/6 Plus from Amazon? Haven't had time to replenish the best free apps for your iPhone 6/6+ armed with iOS 10/9/8? No biggie! Here I sort through the iOS Apple store and pick out the top free iPhone 6 apps with a desire to aid you to utilize your new iPhone 6 (Plus) to the best advantage. 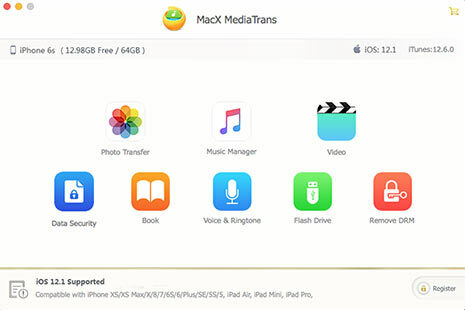 Not world-famous as CopyTrans the MacX MediaTrans is, but it's surely a well-received file transfer app for iPhone 6/Plus/6s/SE iOS 10/9/8 devices. It lets iPhone 6 users transfer music, photos, videos and more from iPhone 6/6s/SE/7 iOS 10 to computer Mac/Windows 10 in batch with seconds only (100 4K photos only 3 seconds). Also as an outstanding iTunes alternative, it does what iTunes can't do. No matter videos of MP4, MKV, AVI, MOV, FLV, it can hassle-free sync videos from computer to iPhone 6 iOS 10/9 device without any format issues (built-in video convert feature). Another feature worth a mention is that this iOS iPhone transfer app can even mount your iPhone 6 as hard drive to store any files, apps, media files, PDF, PPT, etc. With the brand new iPhone 6 (Plus) equipped with a full HD Retina display, it's next the best thing to watch video or TV episodes thereon. Yet if you meet this embarrassing condition that when dozens of friends come to your house and you wanna share something interesting with them on iPhone 6/6 Plus, but sorry to find your iPhone 6 display is too small to satiate so many people? In such case, what if you can airplay the video music from iPhone 6/6 Plus to your Mac or Apple TV with a much bigger display? 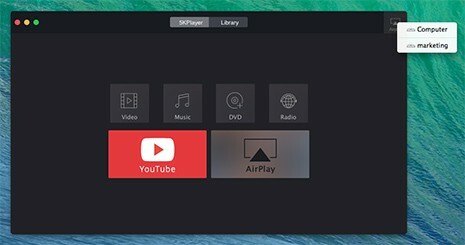 Here I would like to share with you one useful AirPlay sender yet receiver-named 5KPlayer, which enables you to stream video audio from iPhone iPad iPod to your Mac/PC computer or even Apple TV without any buffering or freezing. Don't believe this? Go to Wi-Fi covered area and give it a shot! And I bet you will love it to death! Reluctant to miss any hit single? Download the best iPhone music app Spotify and you can find and enjoy any hot song from Sony, EMI, Warner Music Group and Universal for free. This best music app for iPhone 6 is accessible for you to search track, artist or album as long as you have registered a free account with solely 3 steps. >>> Click to see how to download Spotify music with no hurdle. When sitting in the coffee shop, if you are always caught by its fair-sounding music? In such case, whether you want to apply your iPhone 6 to scan the song and find it? Now the well-known music recognizing app called Shazam hits the spot. It's generally described as a magic when you first use it. It's dead easy to use — hold your iPhone 6 near to the music source, and wait while it listens, scans your surroundings for music and finally finds the titles for you all on its own. Irrespective of iPhone or Android smartphone, the essential function is to let you reach the people you care about. And this free iOS 11 app just aims to achieve this goal in a much more convenient and varied way, which aids you to contact friends instantly through free texts, voice messages, photos, group chats and even phone calls with this independent app for iOS. Thus just make a free call, even to the friends abroad without worrying about phone signal any longer. Similar to the former free app for iPhone 6, this top iPhone 6 app Snapchat is also designed for you to have a fast yet fun interaction with your friends. And the distinct difference lies in that this best free software for iPhone is apt to let you share your daily life with your videos and photos and take a screenshot on the funny things you like. Also you can have a live video or face-to-face chat with your friends miles away. For Your Reference: Another social networking app for iPhone 6 & iOS 10 - Facebook which is also the ideal free app for iPhone users to communicate with friends and allows you to upload your self-shot videos for sharing in Facebook best supported video format. Provides a simple way to capture and share the world's moments on your iPhone 6. Transform everyday wonderful moments into works of art you desire to share with friends and family. Timehop accumulates your old photos and updates from Facebook, Twitter, Instagram, and your camera roll. It makes all these memories into easily sharable items, assisting you to tell the fantastic stories of the past. Dropbox, the top free iPhone 6 app, is much easier to use than most of its counterparts, which helps you transferring files between your Mac computer and iPhone 6 and also enables you to access them, download them, and in many cases, view them. After free downloading this best-ever yet free app for iPhone 6, you are able to open a free account and locate your iPhone 6 within barely seconds. It's the must-have iPhone 6 app to refrain your iPhone 6 from being stolen or lost. Tips: Dream about playing back the collected HD movies and videos on iPhone 6/6s (iOS 10) on the move? The ultimate solution is to seek help from the professional yet reliable video converters, among which the stellar MacX Video Converter Pro is of the first water to convert any HD or SD video to iPhone 6/6s compatible MP4, MOV, M4V with 98% quality reserved and world's fastest speed (Intel Quick Sync Video/Nvidia/AMD hardware acceleration supported). Warm Prompt: The above-mentioned top free apps for iPhone 6 (Plus) are not all-inclusive and may be my favorites. Assuming you think I overestimate some free apps for iPhone 6 and iOS 10 or miss certain awesome free apps, please feel free to contact me and let me know. Welcome your complements and advice.